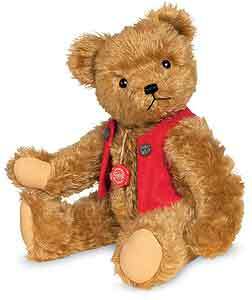 Teddy Hermann Fred Bear is Fully jointed and made of the finest golden russet Mohair. He wears a wool felt waistcoat with a decorative wood look button at the top, each side. Handmade by Hermann Teddy Original, Fred is a limited edition of only 60 pieces! what a bargain price for this size bear. He has safety eyes, synthetic filling material, non growler, Mohair, surface washable only, size 40cm tall.